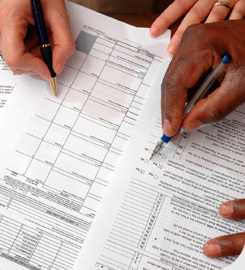 With our tax services you�ll get cost-effective advice, advocacy and action. LM Austin offers comprehensive tax services to assist you in meeting your immediate and long-term personal and business objectives. We provide Tax Compliance, Tax Planning and Representation in Tax Matters with the IRS and State tax agencies. Contact us today for more information about LM Austin LLC�s Tax Services. We prepare income tax returns and information returns for individuals, corporations, partnerships, not-for-profit organizations, estates, and trusts. Because we know you need more guidance than you can get from meeting with a tax preparer one time a year, we take a proactive, relationship-driven approach in providing you with valuable tax planning strategies and tax compliance consulting all year long. That means you can move toward your goals with confidence, knowing that the guidance we offer is based on our solid understanding of the tax code as it applies to your specific situation. Comprehensive tax planning is an essential strategy of any successful business. By using our experience and up-to-date knowledge of new tax law developments, you can minimize your current and future tax liabilities. Our years of experience dealing with complex tax matters enables us to effectively represent you in resolving issues involving the IRS or State tax agencies. If you have received correspondence from a taxing authority requesting further information, or indicating that you are being audited, give us a call. Proper and competent representation is often the key to successful resolution of a tax controversy.